Whether we’re trying to grab a few minutes of rest or need to make a deadline, the YouTube Kids app is a great way to ensure that our little ones stay entertained without worrying that they’ve tapped on something they shouldn’t. However, some possible upcoming changes to the app might make it even easier for parents to ensure their kids are sticking to Peppa Pig and Paw Patrol. 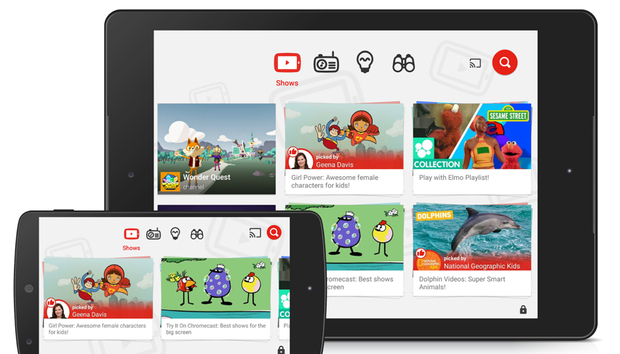 In its customary APK Teardown, Android Police has spotted some interesting code strings that suggest Google may be developing a new Family Link app for remotely managing content in the YouTube Kids app. Currently, any content restrictions need to be made in the app itself, but this new feature will seemingly let parents manage their child’s search and content settings and block videos from their own device. That means if you’re at work and your child is with a babysitter, you’ll presumably be able to see what they’re watching and shut it down if you don’t think it’s appropriate. Additionally, Android Police has discovered a new icon of an animated video game controller. While there isn’t any information beyond its existence, the site surmises that it likely signals the addition of a new page dedicated to gaming videos along with the usual Shows, Music, Learning, and Explore tabs. Neither feature has gone live in the YouTube Kids app yet, but to keep up with the latest changes to the app, you can side-load the Google-signed APK from APK Mirror. Watchful eye: It’s a fact of life that our kids have much more access to unsavory material than we ever did, and that’s why we love the YouTube Kids app. Curated for innocent eyes, it keeps our little ones entertained without us having to hover over their shoulder every time they get bored with whatever they were watching and start a new video. But since nothing’s perfect, the ability to remotely manage their content without needing to wrestle the device from their little hands is a great idea.